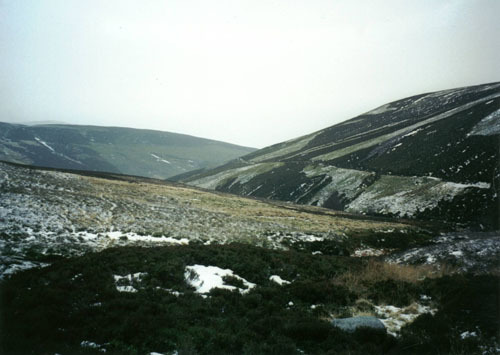 Mount Battock, above Glen Esk, is the country's most easterly Corbett. For fairly fit hillwalkers, it's an easy climb at any time of the year. On our first visit, in January, we experienced a delightfully sunny and crisp winter day, crunching through fresh snow on the ascent and then using our survival sacks to sledge part way back down again. The views were tremendous - a vista to Lochnagar providing one of the highlights of the day. The second visit, in February, was an altogether different affair. It was raining heavily as we prised ourselves from our cars and set off into the cloud. The downpour turned to sleet on higher ground. However, clad in acres of fleece and Gore-Tex and nourished from within by flasks of thick vegetable soup, it was no less enjoyable, although we had to make do with limited views. 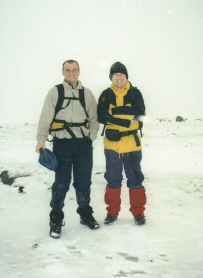 The two experiences provided a vivid contrast of just what a fickle friend our great Scottish weather is. There's a small parking area by the BT phone box over the bridge from Millden Lodge at the start. Set off up the track as it rises gently to an old stone mill building with green painted doors and windows. The way curves left, skirting the edge of woodland, to reach a cottage and outbuildings at Mill of Aucheen. A junction is reached a short way on. Turn right and the track skirts along in front of a small cottage to reach a gate. Go through and follow the track as it stays close to the edge of the field, heading towards more woodland. Ignore a gated track on the right and follow the route along the northern edge of the plantation. At the bottom of the steep tree-covered bank on the right the wide and shallow sweep of the Burn of Turret flows down, destined for the River North Esk. The track dips beyond the end of the woodland to reach a gate. Beyond this it reaches a stream. This can either be forded or, if you want to keep your boots dry, a convenient pair of footbridges is provided immediately to your right. On the other side the track rises once again above a delightful little wooded gorge. It goes through an open field where grazing sheep are often to be found. Carry on through another gateway at the end of the field to reach the next junction of tracks a short way beyond this (you will return to this point later in the day). Bear left here and the way climbs over open heather moorland where Black Grouse and rabbits thrive. Pass through another gate higher up and, in a short distance, the track curves right and starts to rise again, skirting round the southern flank of Allrey. On the slopes above you may see mountain hare darting around. The way heads north to reach Black Burn. There is no bridge at the crossing point but it is not deep and easily forded. A short walk up the track and a small wooden shelter is reached, a fine spot to pause for a breather. From the hut the climb becomes tougher as you rise on to Mount Battock's outlying top. The track serves a series of grouse butts scattered over the higher ground and you will soon reach a fence running west to east. This is well placed as a navigational aid as it runs over the 717 metre top and then down into the col. 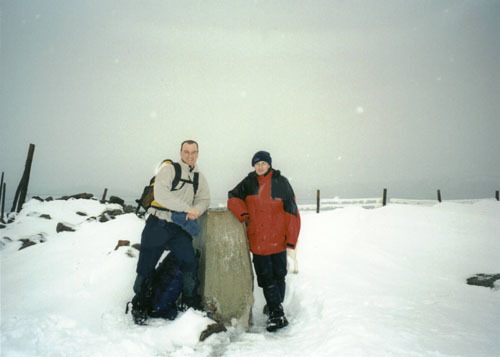 It rises over the western flank of Mount Battock, guiding you right on to the top, where a trig point and cairn are to be found. There are excellent views. To the west the crags of Lochnagar can be seen on a clear day. Directly east is the neighbouring peak of Clachnaben with its easy-to-recognise granite tor. Beyond this the North Sea and Scotland's oil capital, Aberdeen, are visible if the weather's fine. Navigating your way down is once again made easy thanks to the presence of a fence. Follow the posts and wire south from the top, descending into a wide col, then savour an easy climb on to Hill of Saughs. From here it's pretty much down hill all the way. 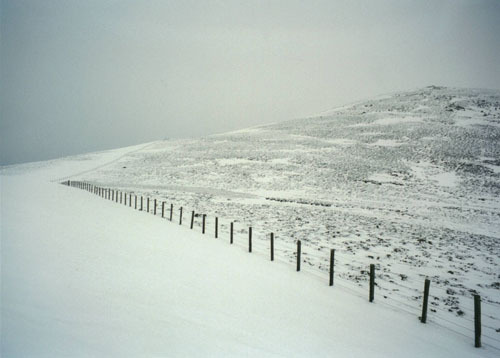 The boundary fence leads into the pass between Hill of Saughs and Hill of Fingray, meeting up with a track. When you join this, turn right and follow it down over Hill of Turret. It makes a sharp right turn lower down and descends, passing through a gate lower down, to a wooden footbridge over the Burn of Turret. The way rises up the bank on the other side to reach the junction of tracks where you branched off earlier in the day. Retrace your steps from here to the start. Grading A straight-forward route for fairly fit hillwalkers and older children. Dogs need to be on the lead in places due to sheep and/or cattle grazing.